Origin and Habitat: Brahmaputra River system in Assam and northwest Bengal states, India. Found in shallow streams thick with aquatic or marginal vegetation and a sand or gravel substrate. 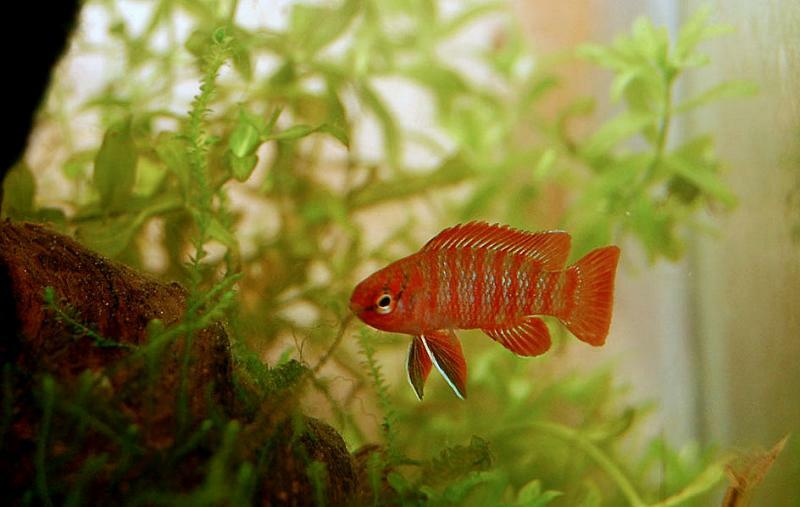 Compatibility/Temperament: A naturally shy and retiring fish, it may be maintained in a community tank of very peaceful fishes that are not active such as smaller rasbora (Boraras and Trigonostigma sp. ), pygmy gourami, small characins, and any of the dwarf Corydoras species. Males may be aggressive particularly in small tanks. Naturally feed on insect larvae, small crustaceans, worms, zooplankton; offer live foods (artemia, blackworms, daphnia), frozen bloodworms, daphnia and brine shrimp. Active tankmates may result in this fish refusing to eat. Males attain 2 cm, females less; the smallest known percoid species. 5 gallons but preferably 10 gallons. Soft to medium hard (< 15 dGH), acidic to basic (pH 6 to 8) water, temperature 18-26C/65-79F. A truly beautiful gem of a small fish. Males have seven dark scarlet vertical bars along the sides; on females the stripes are either absent or indistinct. The second photo above, by Nonn Panitvong (Siamensis.org), shows a pair with the male on the left and the female on the right. Given its very small size--this is the smallest known fish in the order Perciformes--this species is very suitable to nano style tanks and small planted aquaria. In a 5 or 10 gallon aquarium either a pair or one male with 2-3 females is recommended, and in larger well planted aquaria a group of males/females. The males will form small territories, and plants and pieces of bogwood should be placed so as to provide suitable territory boundaries. The substrate may be fine gravel or sand, and floating plants should be present to shade the light. This fish remains close to the substrate. This species was described as Labrus dario in 1822 by F. Hamilton who placed both it and what is now Badis badis in the genus Labrus in the marine wrasse family Labridae. Both fish were subsequently re-assigned to the genus Badis erected by Bleeker in 1853 under the freshwater fish family Nandidae. In 1968, Barlow et.al. erected the family Badidae and assigned the genus Badis to the new family. Talwar and Jhingran (1991) considered both fish to be one species, Badis badis, while Tomey (1999) considered D. dario to be a subspecies, B. badis bengalensis. In 2002, Kullander and Britz revised the family Badidae and erected the genus Dario for three species, Dario dario (the neotype species for the genus), and two new species D. dayingensis and D. hysginon. Barlow, George W., Karel F. Liem and Wolfgang Wickler (1968), "Bandidae, a new fish family--behavioural, osteological, and developmental evidence," Journal of Zoology 156 (4), pp. 415-447. Kullander, Sven O. & R. Britz (2002), "Revision of the Family Badidae (Teleostei: Perciformes), with description of a new genus and ten new species," Ichthyological Exploration of Freshwaters, 13(4), pp. 295-372.